Find strengths in your favorite characters! Almost everyone loves losing themselves in a movie. With this exercise, you can increase the pleasure, engagement and personal meaning in your movie watching experience. Select a movie that has inspired you. Watch the movie with an openness to learn, to feel, and to understand yourself and others. As the credits of the movie roll, be present to what is stirring inside you. What do you feel? What character strengths are bubbling within you? Take notice of any motivation to positive action that you sense that might benefit yourself or others. Write down what you are most inspired by from the movie, whether that is a particular character, a dialogue or quote, a plot development, an interaction or scene, a cinematic element such as the scenery, lighting, music, etc. 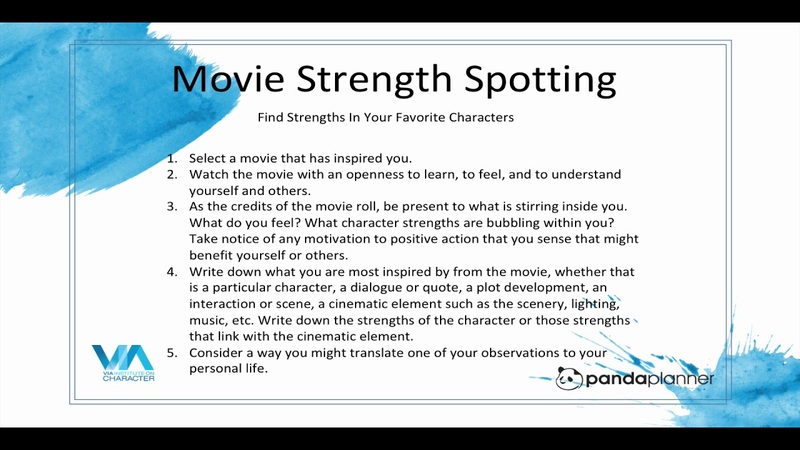 Write down the strengths of the character or those strengths that link with the cinematic element. Consider a way you might translate one of your observations to your personal life.